When Bukalapak raised an undisclosed funding round in January 2018, it also joined an exclusive club: Indonesian unicorn. The ecommerce marketplace became just the fourth Indonesian startup to be valued above US$1 billion, joining Go-Jek, Traveloka, and rival Tokopedia. It’s an important achievement – and a welcome change. Bukalapak is locally prominent, but from an international perspective, it has long operated in the shadows of Tokopedia and regional players Shopee and Lazada. Now, it’s getting more attention from the media, prospective employees, as well as stakeholders like the Indonesian government, says co-founder and president Fajrin Rasyid. At the same time, Rasyid insists that unicorn status was never the destination. Bukalapak intends to do so through strategies like fintech offerings (such as e-wallet BukaDana and mutual funds product BukaReksa), artificial intelligence (to enhance user experience), and government services. It has also set up an R&D center in the Indonesian city of Bandung. But there’s also a larger ambition: venturing offline. Indonesia’s ecommerce industry may seem huge at first glance, but according to McKinsey & Company, it only represents 3 percent of total retail in 2017. Doing retail would allow Bukalapak to significantly expand its customer base. Bukalapak’s offline strategy is synonymous with Mitra Bukalapak, a program the company first introduced in late 2017, and in which it is investing US$70.5 million. Through Mitra Bukalapak, which translates to “Bukalapak partner,” the company ties up with small offline businesses around the country for two purposes. First, the program lets a warung or roadside kiosk sell Bukalapak-powered digital goods – phone credits, train tickets, electricity tokens – to offline customers. 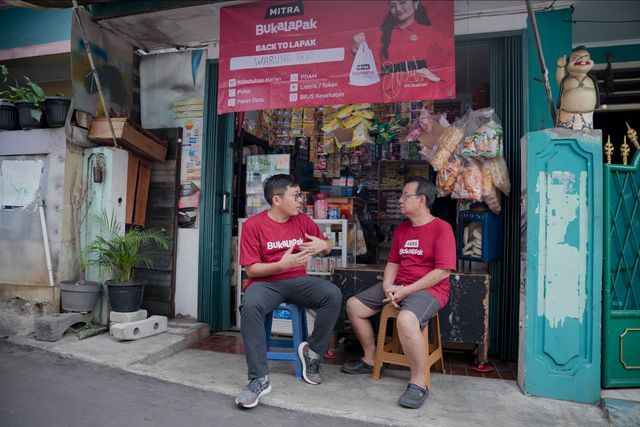 Second, it lets these offline businesses purchase inventory, such as instant noodles, cigarettes, or fast-moving consumer goods, through the Mitra Bukalapak app. These goods are fulfilled directly by distributors on the Bukalapak platform. Offline customers, especially those unaccustomed to online shopping, can also ask a Bukalapak partner to make an online purchase from the Bukalapak platform on their behalf. The potential is so vast that, according to Rasyid, accurate data on the number of warungs that exist in Indonesia is hard to find. Bukalapak focuses on the overall growth numbers of its Mitra business as well as the growth of each partner’s revenue. “[Going offline] lets us apply a broader vision for the small-to-medium economy in Indonesia,” he says. Bukalapak is hardly the only player setting its sights on the offline segment. Tokopedia, for one, raised a mammoth US$1.1 billion round late last year to empower both online and offline commerce. It had also rolled out Mitra Tokopedia – a similar product with a similar name to Bukalapak’s – in late 2018. There is also Warung Pintar, a startup backed by Tokopedia investor East Ventures, which develops digitally enabled, prefabricated warungs that are managed by micro-entrepreneurs. The model is not limited to Indonesia – a startup called Growsari is also tackling a similar problem in the Philippines. Bukalapak isn’t daunted by the competition, Rasyid says. Going offline also opens up Bukalapak to possibilities in online-to-offline integration between its products and services, and the company has started dipping its toes through several activities. One promotion saw instant noodles being sold for 1 rupiah online through the Bukalapak platform, but redemption is done offline via a Bukalapak partner. Another example is providing vouchers for use in the Bukalapak app to customers who primarily shop from the company’s offline partners. “We want to make it such that it wouldn’t matter whether [goods are sold] online or offline,” he says. As Bukalapak grows its offline reach, the company continues to differentiate its online offerings, especially in fintech – a natural progression for many ecommerce companies. The company also offers an installment plan in partnership with fintech startup Akulaku as well as two investment products: BukaEmas, which allows users to purchase gold (still popular in Indonesia) starting at very small amounts, and BukaReksa. Merchants can also get loans from Bukalapak to expand their businesses through the BukaModal program. The company partners Bank Mandiri, Indonesia’s largest state-owned bank, and online lending startups Investree, Modalku, and Koinworks for this program. It is also looking to launch an insurance product in the near future. According to Rasyid, Bukalapak’s investment products have performed similarly to Mitra Bukalapak. The number of transactions has grown, but because many users are first-time investors, the amounts remain relatively small. On average, they range from US$7 to US$35. Bukalapak’s approach to developing new products tends to be organic and inspired by merchants’ needs, says Rasyid. One such example is BukaReksa – the result of a partnership with digital investment platform Bareksa – which lets merchants invest part of their sales proceeds in the Bukalapak e-wallet. One thing that Bukalapak has done somewhat differently is to set up an R&D center in Bandung, a city three hours south of Jakarta. For the center, the company partnered the Bandung Institute of Technology (ITB), one of Indonesia’s premier universities and the alma mater of Bukalapak co-founder and CEO Achmad Zaky. The R&D center allows employees to pitch ideas, and one that has been implemented is BukaBike, a bike-sharing program currently live in the ITB campus. But ultimately, the center focuses on ideas that can add value to the Bukalapak platform. This could include government and public service-related products – Bukalapak recently launched a feature for users to pay motor vehicle taxes. Rasyid says that partnering a university allows Bukalapak to collaborate on scholarship programs and internships, which can lessen the gap between the skills of local graduates and what the industry actually needs. Jakarta remains the center of Indonesia’s tech scene – almost all of the major tech companies and venture capital firms are headquartered there – but the quality of life, with its notorious traffic jams and pollution, can be subpar compared to other parts of Indonesia. In addition, many tech talents come from universities outside of Jakarta, like ITB or Yogyakarta’s Gadjah Mada University. Other than Bandung, the company plans to develop other R&D centers in Yogyakarta, Medan, and Surabaya (which would launch in the near future according to Rasyid). As of now, Bukalapak has 4 million merchants on its platform, with about 50 million monthly active users. Its undisclosed unicorn-making fundraise was followed by another investment last January – a US$50 million round from a fund jointly set up by Mirae Asset, a South Korean financial services group, and Naver, the parent company of Japanese social messaging app Line. The company declined to disclose their latest GMV figures, though based on a statement earlier this year, its monthly GMV amounted to US$283 million. In comparison, Shopee, which claims to be the top ecommerce platform in Southeast Asia, posts somewhere between US$575 million and US$608 million in monthly GMV for its six markets in the region, based on the company’s estimate for 2018. But unlike Shopee and Lazada, Bukalapak plans to focus exclusively on Indonesia for the time being. This puts Bukalapak in a head-on race with Tokopedia. The latter does not disclose GMV figures, but by most public accounts, it is currently in the lead. According to AppAnnie, Tokopedia is Indonesia’s top ecommerce app based on monthly active users. And of course, there’s the matter of the two companies’ latest funding rounds – Bukalapak’s US$50 million raise is 4.5 percent the size of Tokopedia’s. On the flip side, it can be said that Bukalapak has done well with what it has. Being the number two homegrown ecommerce player in Indonesia – and a unicorn to boot – still puts it in front of many others. At the same time, it has fostered a company culture that can perhaps be described as “scrappy” and one with heavier emphasis on return on investment (ROI) compared to better-funded competitors, adds Rasyid. For example, Shopee is widely known for its shipping subsidies, which it has scaled back. But having a war chest means they can afford it. Bukalapak, on the other hand, has offered such subsidies only from time to time, and usually with a logistics partner on board. Rasyid allows that Bukalapak may introduce more shipping subsidies in the future, but they are not a focus as of now because of a lower ROI compared to their other marketing strategies.